Despite living just twenty minutes outside of Philadelphia, I never ventured to the city on my own until attending college in Center City. Commuting over the bridge, walking city blocks between classes, driving in circles around the Ben Franklin Parkway and the dreaded parallel parking constantly gave me anxiety. Let’s not even talk about the one time (yes, one) that I had to pump my own gas…Jersey girls are spoiled for sure. I never would have imagined that my job as a wedding photographer would one day have me mapping out several stops on a wedding day, knowing so much about iconic landmarks throughout Philadelphia or finding myself standing with my face behind a camera being inches away from speeding cars on a Broad Street! 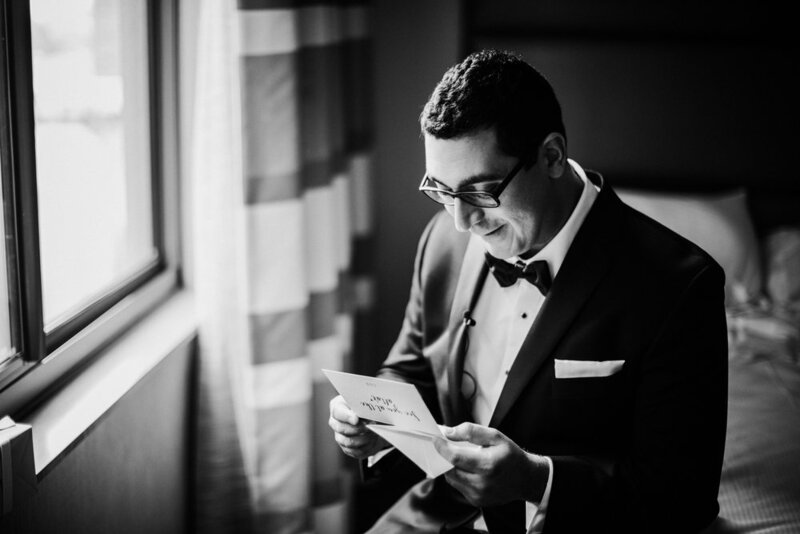 There is always an extra element of adventure and authenticity for a Philadelphia wedding. 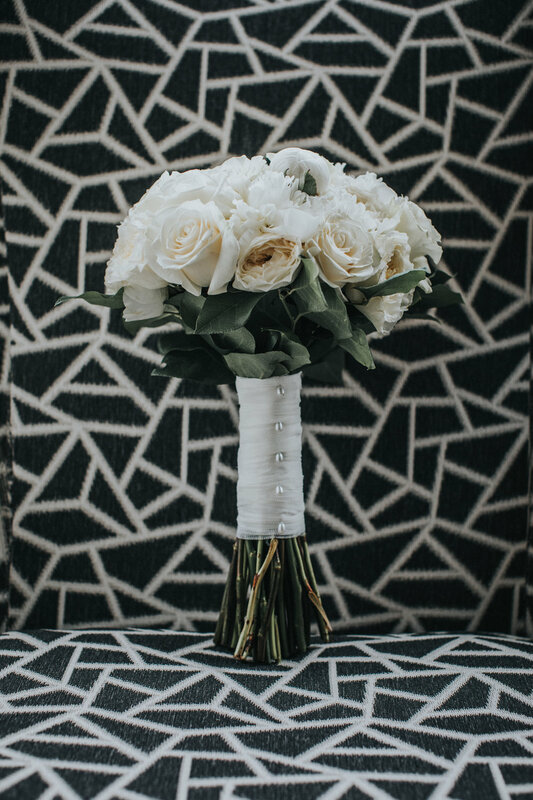 Now, after countless visits to Philadelphia I am in love with the energy in the air and artistic rush that a Philadelphia wedding day brings. I will however never nail that parallel parking thing though. Philadelphia is very special to Laura and Dom as they live and met there. Their paths crossed at the right time in their lives and they made this place home, together. For their engagement session, we explored Old City. They showed me the apartment building they were both living in when they met ( but didn’t know they both lived at the same place), and where their first kiss happened! I got to know and see first hand how in love these two were, and felt the anticipation when they spoke about their wedding plans. When the day finally came, everyone was overjoyed and all of the planning came to life. 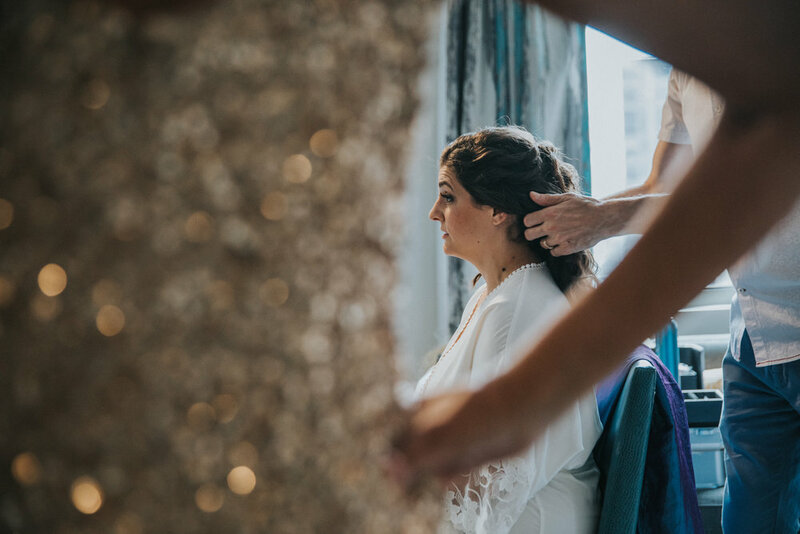 Laura spent the morning getting ready at the Cambria Hotel on Broad Street - a very elegant and modern hotel with the perfect views of the city. After being pampered with hair and make up, Laura read a very sweet hand written note from Dom that accompanied a thoughtful and tasteful gift. Across the street at the DoubleTree hotel, also on Broad street Dom also received a very beautiful note and gift from Laura. Second photographer James captured the guys and Dom’s father helping him get ready to celebrate the big day finally happening! 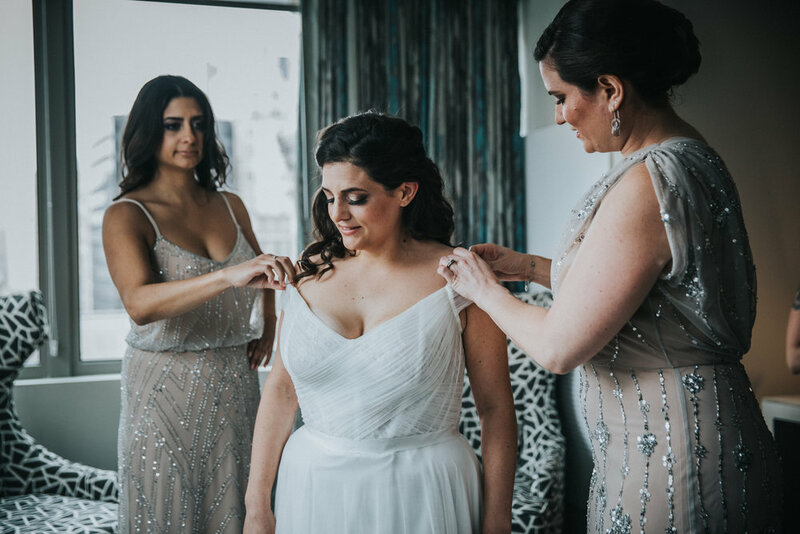 A traditional Catholic ceremony at the gorgeous and sacred St. Monica Parish in Philadelphia was the perfect spot for Laura and Dom to recite their vows to one another. 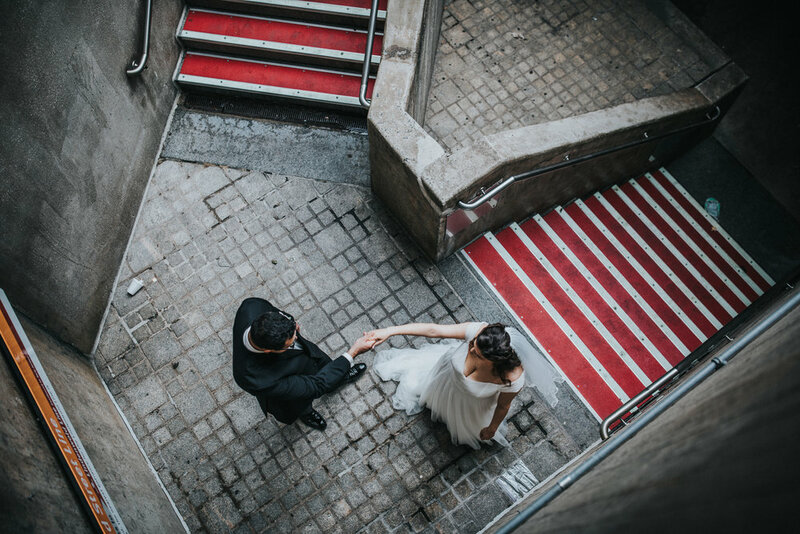 Following the “I Do’s” we enjoyed the city with taking over City Hall, Broad Street, Love Park and a few unexpected locations that sparked inspiration in me along the way! Laura and Dom’s wedding color was Red, so whenever something with red caught my eye (such as the Subway station), I figured out how to make it unique enough to reflect their wedding style! After taking over the streets of Philly, Dom and Laura along with their closest 250+ friends and family members partied all night at the gorgeous Arts Ballroom. The venue is rather new to the city and certainly stands on it’s own with a grand staircase and high ceilings. Elegant arches and columns reflect the architectural influence from the historical city, and felt just right for this main event! I am so happy to have met these two happy souls, and thankful for their trust in me as their wedding photographer. I am excited to see what the future brings you both. Congratulations again Laura & Dom!